(CNN) - The Republican National Committee is continuing its attack on Obamacare, this time with an ad aimed at one of the law's premier audiences, young people. The RNC says that they'll run a commercial Tuesday night on Jon Stewart's "The Daily Show" on Comedy Central, a program that's popular with younger viewers. The spot, which the party committee says will air only in the Washington, D.C. television market, is one of four the RNC has produced. All four ads are themselves ripped from popular culture, featuring two characters, "The Private Sector" and "ObamaCare." The ads are inspired by the Apple commercials that featured actor Justin Long introducing himself as "I'm a Mac," in contrast to his bumbling friend, "I'm a PC." Those spots stopped airing in 2010. The ad that will run Tuesday night is called "Down," and features an overweight "ObamaCare" who's "just down for a little maintenance." "Down for maintenance?" "The Private Sector" says incredulously. "I don't understand. I work all the time. 24/7. Customers depend on it." "Hey look, before you know it, we'll be just like the DMV," "ObamaCare" replies. The partial government shutdown over funding of Obamacare and especially the disastrous rollout of the health care law's online insurance exchanges have emboldened Republicans. They continue to hammer the law, formally known as the Affordable Care Act, which is shaping up to likely be one of the key issues of the 2014 midterm elections. "The disastrous rollout of healthcare.gov is just the latest evidence that the massive legislation was poorly conceived and terribly crafted," RNC Chairman Reince Priebus said in a statement announcing the ads. "These videos help to convey the absurdity of ObamaCare and the administration's careless behavior." It is precisely the demographic that watches "The Daily Show" that the Obama administration needs to sign up for health insurance through the online marketplaces. They need young, healthy and low-risk consumers to buy into the system in order to offset the cost of insuring individuals who use far more health care. Otherwise, premiums will rise precipitously. –CNN's Bryan Koenig contributed to this report. ...and I voted for him in two elections. Suuuuuurrre you did! And I voted for grumpy old man & dim bulb barbie in '08, and mr. 47% car elevator and the guy who has been feeding at the government trough his entire life but now wants to take away everything from everyone else! @freedom...you soun desperate this morning. Tell us all what he lied about now. Or better yet, just stand back and shriek benghazzzzzi!!! At least that way you won't look desperate, and stupid. Great ad buy for the GOP – John Stewart will cancel a lot of it right out. 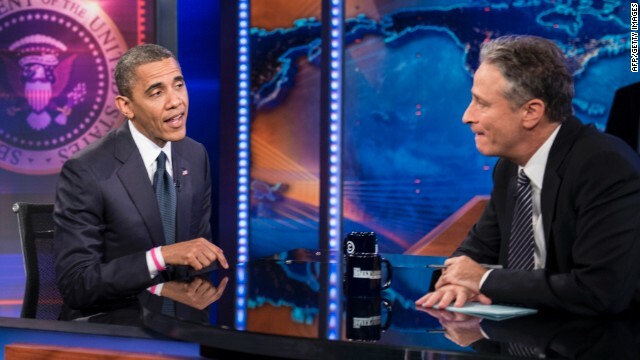 Who do you think will hold more sway with the Daily Show audience – the lying GOP or John Stewart. Hmmmmmm – let me think about that awhile. Spend your money GOP. Love it. GOP has lost all of its bearings. Target the young ones? Of what age? Let them go ahead and do it and they will see how each and everything will backfire in a big way. Are they under-estimating how the young ones especially of this current generation think? In addition to trying to discourage young folks from becoming personally responsible for the costs of their medical care, do the Repubs. offer any ALTERNATIVE to Obamacare ? LOL..."The Private Sector"? Laughable. You mean the private sector "free market" of health insurance that resulted in the elderly going bankrupt, living with their children, having retirements ruined by health care costs, being unable to get appropriate nursing and hospice care at the end of life and thereby necessitated Medicare? Which left the poor and their children without care whatsoever and necessitated Medicaid being enacted? The private sector that has resulted in 48M people being uninsured, caused skyrocketing health care services and insurance costs, is based entirely on the profit-oriented model of "give us your money and we'll do everything we can to deny you coverage," and leaves children and others with pre-existing conditions uncovered, does nothing for the lifelong disabled and infirm? Here's a big fact hint: THE "PRIVATE SECTOR" HASN'T BEEN GETTING THE JOB DONE FOR 70+ YEARS...IT IS WHY WE ARE WHERE WE ARE, WHY WE'VE DONE THE THINGS WE'VE DONE OVER THE PAST SEVERAL DECADES AND WHY WE NEEDED TO DO SOMETHING AGAIN. The "private sector" = STATUS QUO. Psssst...yes, we know what you meant. Just rankles you no end that you don't get to call them "boy" anymore, eh? Instead of just going after the dems effort, please show us am ALTERNATIVE!!!!!! The GOP seems to think that the private sector is infailable which is wrong. Look at the rules we have. Why do we have them? They are in place because the private sector (and individuals) have hurt people and need to brought to account for the mistakes that were inflicted on society. If the conservatives, GOP, Republicans, teapublicans and others can come up with a better idea, then share it. My idea is that the wealthy 2% put in a percent or two of their weath into a non-profit medical insurance program that anyone can get into so the government doesn't have to worry about people racking up huge debt going to the ER for things that would have been caught early if they had a primary care doctor. @sniffit...Oh my heavens they hate not being able to call him boy, or any other of their joyous plethora of insults. But do not dare call them racist. the young people of today are much to smart to be taken in by the republican lies. Waste your money repos. 24 billion to shut down the government. We won't forget that either. One of the biggest lies of all time. Let's get the aircraft carrier out and unfurl a sign that says "If you like your plan you can keep it". Bottom line is this – those that still believe and support this president and his programs do so only for one reason...they hope to get something for free, at someone else's expense. "But do not dare call them racist." Hehe...I call 'em racists all day long. It drives them nuts and provides me with endless entertainment. I really feel sorry for people who are dependent on the government for anything. Funny, It seems to me that I remember the conservative/republican/tea party/, narrow minded among us, making light of all said on the Daily Show, like it was to be ignored as if it were a poor relative. Now that they've said something they can use to their advantage, they try to milk it for all it's worth. Hypocrites one and all. Quite the opposite actually: We want deadbeats to start paying their own way and stop sticking those of us responsible enough to cover our own medical care with the bill. Me too. Perhaps it's time to offer all those dependent corporations the dignity to pay their own way. Well in that case, tell the House to hurry up on the new five-year Farm Bill, which they've been dragging their feet on. The farmers need their subsidies. Little kiddies need the milk subsidies passed so that the price of milk doesn't double come Jan. 1. Federal corruption charges.extortion, bribery, INSURANCE FRAUD, money laundering and racketeering . We must stop ObamaCare , Don't let ObamaCare make it harder for hard working republicans to commit fraud ! ObamaCare will destroy the very fabric of our freedom , We all know Republicans never commit "INSURANCE FRAUD" on Sundays.